Tiger and Phil are gifted pitchmen, but they're not paid actors. They won't be able to feign camaraderie for an entire round. Friday's match will give fans an opportunity to see how the foes-turned-friends actually interact with each other. You may be excited about this Tiger Woods-Phil Mickelson match play event. You may have no interest. Either attitude is fine. It is an unusual sporting event. Fans are being asked to pay $19.99 to watch it, which is $19.99 more than it costs to watch the Masters, but also just $6 more than a Golf Ball Holder With Quick-Draw Release, and I bet you know a golf nerd who thinks he needs that, because Hogan would not be caught dead with a golf ball holder with a Slow-Draw Release. Instead of Jim Nantz on the mic for Tiger-Phil, we get an announcer, Charles Barkley, whose golf swing looks like a vegan being forced to slice a steak. The winner gets $9 million. The loser can still afford his hotel suite, but I’m going to take a wild guess here in saying he still won’t have to pay for it. If you think this is silly, then hey, don’t watch. If you think it will be fun, order it. I think reasonable people understand that The Match, as it is called, is not about growing the game. It’s not about deciding the better player historically (Woods) or now (Woods). It won’t detract from anything meaningful in golf. It is a piece of entertainment designed to please customers and make money for the people producing it, just as most pieces of entertainment are. Playing golf on TV for a lot of money does not make Mickelson and Woods greedy. It makes them professional golfers. You know who understands this? Jack Nicklaus. I mean, I didn’t ask him, but there was no need. He played in one of these deals with Woods in 2002. They faced Sergio Garcia and Lee Trevino. As I fondly recall, somebody probably won. The point: This is not new. But it does feel different for two reasons. One is that everything with Woods this year feels different. It is still hard to believe he is back playing as well as he has when so many people assumed he was finished. The other reason is that golf fans will get to see how Woods and Mickelson interact. It is easy to mock their newfound buddy comedy as a faux friendship built on a stack of hundred-dollar bills to promote The Match. But that ignores history. When Woods first did one of these made-for-TV matches in 1999, his opponent was David Duval. There was some blowback at the time, which was as silly then as it is now. But there was also a weird coolness to the event. Woods and Duval played at Sherwood Country Club, where Wayne Gretzky had a home, and Gretzky was there, watching. Woods was asked afterward if he would do another event like it, and he said, “I hate to say it, but it's basically up to the ratings. How high the ratings are will determine how successful it was." They were high enough. Woods was the king of the sport in those days, doing things that no golfer had done before. The next year Woods faced Garcia, in the days before the Tiger-Sergio feud got ugly. The format kept changing, to keep it fresh—that’s why Nicklaus played—but the one constant was Woods. The events only happened because Woods was such a phenomenon. 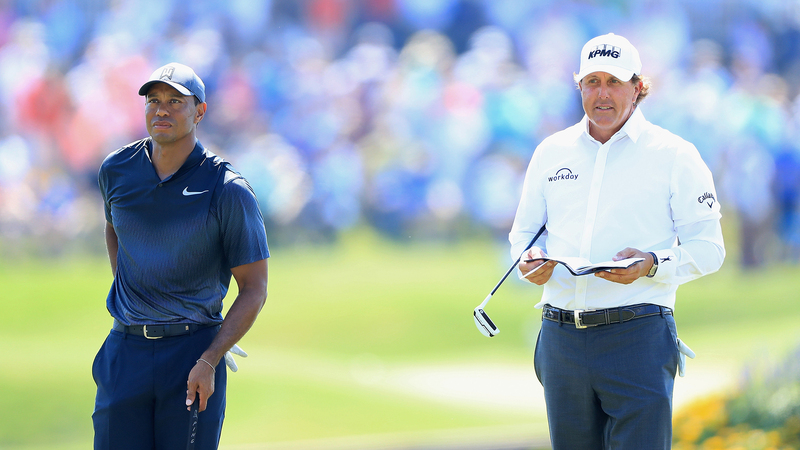 Mickelson eventually emerged as the clear second-best player of his generation, the only one whose popularity even approached Tiger’s. Woods finally included Mickelson in his made-for-TV events in 2003, 2004 and 2005. But it was telling that they were never teammates, and the on-course banter between them was minimal. The relationship was frosty. This was common knowledge. Now Woods and Mickelson have the kind of relationship that a lot of people wanted them to have all along. They are not best buds. Nobody is claiming they are. But there is a mutual respect befitting of the game of golf. They can play a round together and actually enjoy it. They can tease each other without worrying the other will be offended. The Match will let golf fans see this, live, for a few hours. They are gifted pitchmen, but they are not trained actors. They can’t fake camaraderie for an entire round. The stakes are minimal—it’s all play money to them at this point. But there is still a reason to watch. You know, if you feel like it.